Put some soul into your playing with a tune inspired by the father of soul guitar: Mr Steve Cropper! To most of you, the name Steve Cropper is probably an unfamiliar one, but I bet that you’ve already heard his playing on countless classics such as ‘Soul Man’, ‘Green Onions’, ‘In the Midnight Hour’, ‘Knock on Wood’ and ‘(Sittin’ On) The Dock of the Bay’, as well as a host of other Stax hits. Apart from co-writing and playing these tunes, he also went on to produce records by Jeff Beck, Tower of Power, Joe Cocker and the Temptations and, in the late 70s, toured with the Blues Brothers, at that time featuring comedians John Belushi and Dan Ackroyd. The key to Steve’s playing is simplicity. For example, when there are drums, bass, piano, lead and backing vocals and a bass section you just can’t get too busy otherwise your playing will be lost. So, this tune is pretty straightforward although, as always, the feel is of paramount importance. The second part of soul guitar lesson. Let’s start by looking at the chord chart opposite, since there may be one or two here that you haven’t seen before. The sus2 chords I especially like due to their ambiguous nature. Picture 1 illustrates a good hand position for the A major chord, while the Dsus2 can be seen in Picture 2. Notice that for the D sus2 the first finger is still in contact with the low E string, not fretting it but resting up against it so that it remains quiet in case you accidentally hit it. The Csus2 uses the same shape as the Dsus2 but moved down two frets. Try to keep the hand in the shape of the chord when changing position rather than moving one finger at a time, as this will facilitate faster chord changes. 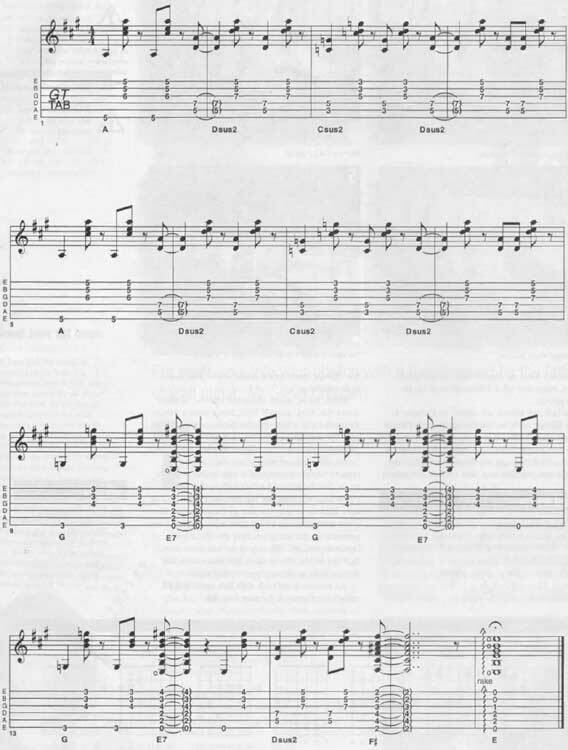 The last two chords are shown in Pictures 4 and 5. Picture 4 shows the F#major, while Picture 5 shows open E, fretted slightly differently from usual. You’ll notice that I’ve fretted the E major using my 2nd, 3rd and 4th fingers instead of my 1st, 2nd and 3rd. This is a neat trick which makes the change from the F# major sound just that little smoother. Okay, we’ve talked about the chords, so what about the ‘Soul’ sound? Well, Steve used a Fender Telecaster and a little Fender combo with a 10-inch speaker, so aim for a very bright tone with the treble pick-up. You may think the sound too brittle when played on its own, but using this type of sound ensures that it can be heard in the track. For the staccato effect ensure that after every note or chord the left (fretting) hand lifts up very slightly to stop the strings from ringing. In other words, hit the chord then relax the left-hand pressure on the strings so that the chord is instantly stopped. When you do this make sure that the fretting hand stays in contact with the strings as to avoid any open string noise. It’s a full lesson of Soul Guitar. Come a Cropper.